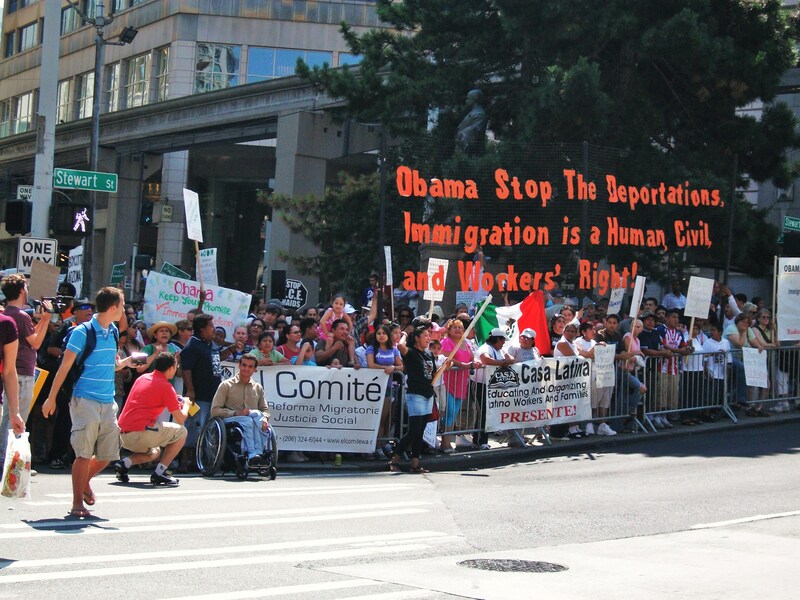 Over 300 Immigrant Rights Activists Take To The Streets In Conjunction With President Obama’s Visit To Seattle. Contact: El Comité Pro Reforma Migratoria Y Justicia Social and the May 1st Action Coalition, 253.347.4229 (Spanish) 360.556.7949 (English). The group initiated the day’s activities by marching from Westlake Park to a small triangle park adjacent to the Seattle Westin Hotel where Barack Obama would be speaking. Protesters, numbering approximately 300 participants, held a small rally in the triangle until they attempted to march on the sidewalks around the Westin Hotel where they were met by Seattle Police in front of the west entrance of the hotel who refused to let the protesters pass and began to push people back using their bikes. Protesters stood their ground. People refused to move and clashes ensued. The Seattle Police pushed demonstrators, including children, in a forceful manner, in effect escalating their tactics. Demonstrators moved back to the triangle and continued their rally. After the presidential convoy arrived at the hotel and the president made his way in, immigrant rights demonstrators again, attempted to march around the Westin Hotel where they were met by police once again who barricaded them from the hotel. As a result demonstrators marched down Westlake Avenue and marched in a circle, jamming traffic in defiance of the Seattle P.D. “We only saw a fraction of the repression our communities face. And we were willing to escalate our tactics due to the overwhelmingly harsh tactics that are used on our communities by the federal government.” said Sandy Restrepo, Secretary of El Comité Pro Reforma Migratoria Y Justicia Social. On November 5th, 2008 a wave of optimism flowed throughout the country with the election of Barack Obama. The framing of the “Hope” and “Change” messages resonated throughout after a conservative majority ran both the legislative and executive branches during most of former President Bush’s Administration. The message was especially symbolic in immigrant communities as mass strikes and demonstrations in the spring of 2006 helped turn back congressional efforts to implement H.R. 4437 (otherwise known as the Sensenbrenner Bill), which would have been the most draconian anti-immigrant legislation in generations and would have effectively criminalized all undocumented workers and their allies for providing them humanitarian aid. The election of a new President and a majority Democratic Congress pointed toward ameliorating the adverse conditions encountered under President Bush and the Republicans. This optimism was short-lived as little has been done and continuation and expansion of Bush-era immigration policy continues unabated. As a result of these policies, the organizers, in addition to the demonstration, also drafted a letter asking that Barack Obama use an Executive Order mandating that the Department of Homeland Security make the E-Verify, 287 (g), and Secure Communities programs in addition to mass raids, a low priority. Three separate copies were handed over to Obama staffers by guests attending the event inside the Westin. As organizers noted, “we mobilized en masse to support the President and his party under the idea that they would take action in a manner consistent with securing civil, labor, and human rights in reformation of our immigration system. In turn, we demand an immediate cease to harsh enforcement-only policies without human and civil rights and are requesting that President Obama make said policy, which has failed our communities and the country in general, obsolete” The full text of the letter can be found at El Comité blog (https://elcomitewa.wordpress.com/). We wanted to take this opportunity to extend a cordial welcome to you to the city of Seattle for the first time since your election. As you may imagine, we still continue the work we’ve done for years as 2010 marks the ten year anniversary of the founding of our organization. Given our previous mobilization and allocation of social capital in supporting your candidacy, as well as that of other elected officials in the Democratic Party, we wanted to draw your attention to the matter of Immigrant Rights, an issue especially pertinent to our communities. First of all, we wanted to acknowledge the Administration for their role in ceasing deportation proceedings for family members of those in our communities whom presently serve in the armed forces. Likewise, we also wanted to acknowledge the shift away from undocumented persons who have young children here in the United States. These are important considerations, and as such, are welcome policy changes. That said, we also wanted to point out the indiscriminate use of Bush-era enforcement mechanisms. Said practices, including but not limited to: implementation of 287 (g), Safe Communities, E-Verify, and dragnet raids, have created added stress to our communities. Granted, a reform that respects civil, human and labor rights may take time to work out, the use of enforcement-only policy, has proven adverse to our communities and the country as a whole, as these actions further corrode the social fabric of our communities and leads toward further economic attrition in an already adverse economic environment. To illustrate our concerns about this, we will point out two examples at the local level, here in Seattle and the other in the rural community of Brewster, Washington. In November of 2009, a local company Seattle Building Maintenance, owned by right-wing radio personality Peter Weissbach, fired over 200 employees, many of them members of the Service Employees International Union. Not only did this virtual raid hamper organized labor, but also removed 200 workers from their jobs, and in effect creating an adverse economic ripple that will impact the community they belong to. Later in February 2010, over 550 workers in Brewster, Washington experienced the same ordeal as they were economically displaced. This perhaps had a much more dramatic effect on Brewster’s local economy considering the scale of not only the community, but the firing as well. At a time when we see economic hardship across the country, the absence of 550 workers’ contributions to the local economy worsens the already horrific economic environment in this rural community. As a result of these measures, we see a very direct, very tangible impact. As evidenced, we see this approach as terribly ineffective in ameliorating the social condition in our communities. Further, we feel that like these flawed programs, congressional efforts do us little service. Just last week a new aid package concerning border security was passed in congress and approved by your administration. This was done, despite evidence indicating that said allocation of funding is unnecessary. As statistical trends note, violence along the border is lower, as is the occurrence of border crossings, largely due to the recession we find ourselves in. Further, allocating this level of funding amidst economic uncertainty is a fallacy in prioritization of programming. We are not in the position to pander politically! And we expect much better from both our legislative and executive branches. What we propose, is for the use of an Executive Order to mandate that the Department of Homeland Security make E-Verify, 287 (g), Safe Communities, and the tactical use of mass raids and deportations, a low priority. Given the state of our economic environment and the residual negative impact that enforcement-only activity has produced in our communities, we deem it very important to reshift focus away from harassment based on ethnic and racial profiling of people who contribute both social and economic capital to the communities they belong to. This would be an excellent way to ameliorate some of the already existing conditions. We can’t turn a blind eye as people are continually deprived of their very basic civil, human and labor rights. Thank you for your time and consideration. Contact: El Comité Pro Reforma Migratoria Y Justicia Social and the May 1st Action Coalition, 253.347.4229. 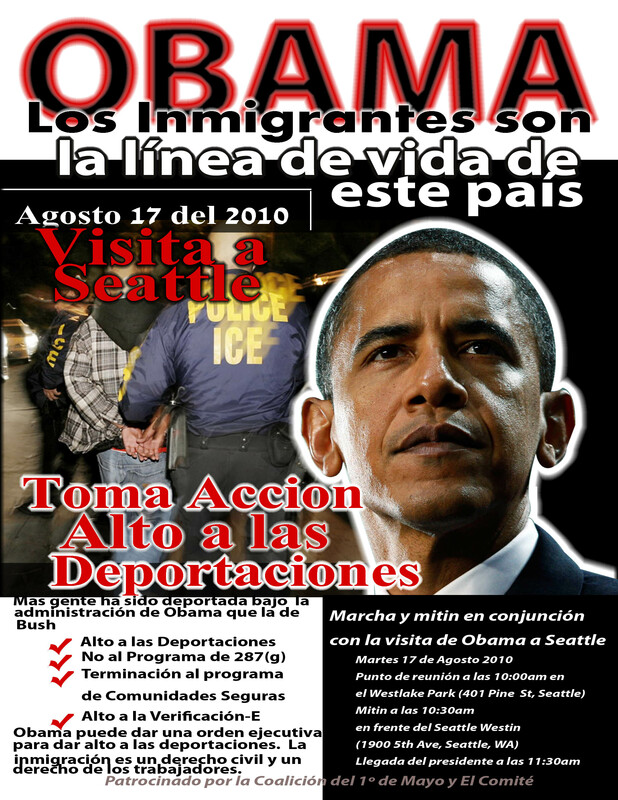 El Comité Pro Reforma Migratoria y Justicia Social and the May 1st Action Coalition To Hold a Demonstration in Conjunction With President Obama’s Visit To Seattle To Protest Enforcement-Only Policy With Immigration Reform, on August 17, 2010.
Who: El Comité Pro Reforma Migratoria Y Justicia Social, the May 1st Action Coalition, and other allied human and civil rights organizations. Where: March will commence at Westlake Park (10 a.m.), Rally in front of the Westin Hotel, 1900 5th AVE (10:30 a.m.). On November 5th, 2008 a wave of optimism flowed throughout the country with the election of Barack Obama. The framing of the “Hope” and “Change” messages resonated throughout after a conservative majority ran both the legislative and executive branches during most of former President Bush’s Administration. The message was especially symbolic in our communities as mass strikes and demonstrations in the spring of 2006 helped turn back congressional efforts to implement H.R. 4437 (otherwise known as the Sensenbrenner Bill), which would have been the most draconian anti-immigrant legislation in generations and would have effectively criminalized all undocumented workers and their allies for providing them humanitarian aid. The election of a new President and a majority Democratic Congress pointed toward ameliorating the adverse conditions our communities encountered under President Bush and the Republicans. Sadly, the optimism was short-lived as little has been done and repression of immigrant communities continues unabated. As such, we are using this visit by President Obama to Seattle as an opportunity to draw attention to the critical situation at hand within our communities. We mobilized en masse to support the President and his party under the idea that they would take action in a manner consistent with securing civil, labor, and human rights in reformation of our immigration system. In turn, we demand an immediate cease to harsh enforcement-only policies without human and civil rights and are requesting that President Obama make said policy, which has failed our communities and the country in general, obsolete. This can be done by the president by way of an Executive Order mandating the Department of Homeland Security make E-Verify, 287 (g), Secure Communities, and mass deportations a low priority. For more information, contact the following: El Comité Pro Reforma Migratoria Y Justicia Social and the May 1st Action Coalition, 253.347.4229. Contacto: El Comité Pro Reforma Migratoria Y Justicia Social y la Coalición de Acción del Primero de Mayo, 253.347.4229. El Comité Pro Reforma Migratoria y Justicia Social y la Coalición de Acción del Primero de Mayo Tendrán Manifestación en Conjunción Con la Visita del Presidente Obama a Seattle Para Protestar la Póliza de Aplicación-Primero con Reforma Migratoria, el 17 de Agosto, 2010. Quien: El Comité Pro Reforma Migratoria Y Justicia Social, la Coalición de Acción del Primero de Mayo, y otras organizaciones aliadas de derechos humanos y civiles. Donde: Marcha comenzara en el Parque Westlake (10 a.m.), Manifestación en frente del Hotel Westin, 1900 5th AVE (10:30 a.m.). En el 5 de Noviembre del 2008 una ola de optimismo fluyo por el país ante le elección de Barack Obama. La “Esperanza” y el “Cambio” eran mensajes resonantes después de tener una mayoría conservadora durante la mayoría de la administración del ex-Presidente Bush. Este mensaje era especialmente simbólico en nuestras comunidades ya que manifestaciones y paros de trabajo en masa en la primavera del 2006 pararon los esfuerzos concrecionares en progresando la legislación H.R. 4437 (conocido como el Sensenbrenner Bill) la cual sería la póliza anti-inmigrante más dura en generaciones y que hubiera efectivamente criminalizado a todos trabajadores indocumentados y sus aliados por proveerles ayuda humanitaria. La elección de un nuevo presidente y una mayoría Democrática en el congreso apuntaban hacia el mejoramiento de las condiciones adversas en nuestras comunidades bajo la Administracion Bush y los Republicanos. Desgraciadamente, el optimismo solo surgió brevemente ya que poco se ha hecho y la represión de comunidades inmigrantes sigue como antes. Eso dicho, usaremos esta visita del Presidente Obama a Seattle como oportunidad de subrayar esta situación crítica en nuestras comunidades. Nos movilizamos en masa para apoyar el Presidente y su partido con la idea en mente que ellos tomarían acción en una manera consistente con asegurando los derechos civiles, laborales, y humanos en reformando nuestro sistema de inmigración. En torno, demandamos un cese inmediato a las pólizas de “aplicación-primero” sin derechos humanos y civiles y exigimos que el Presidente Obama haga dicha póliza, que nos ha fallado a nuestra comunidad y el país entero, obsoleto. Esto se puede hacer por el Presidente por parte de un Orden Ejecutivo con mandato al Departamento de Seguridad Interna de hacer los programas E-Verify, 287 (g), “Comunidades Seguras,” y deportaciones en masa como prioridad baja. Para información adicional, por favor contacte los siguientes: El Comité Pro Reforma Migratoria Y Justicia Social y la Coalición de Acción del Primero de Mayo, 253.347.4229.